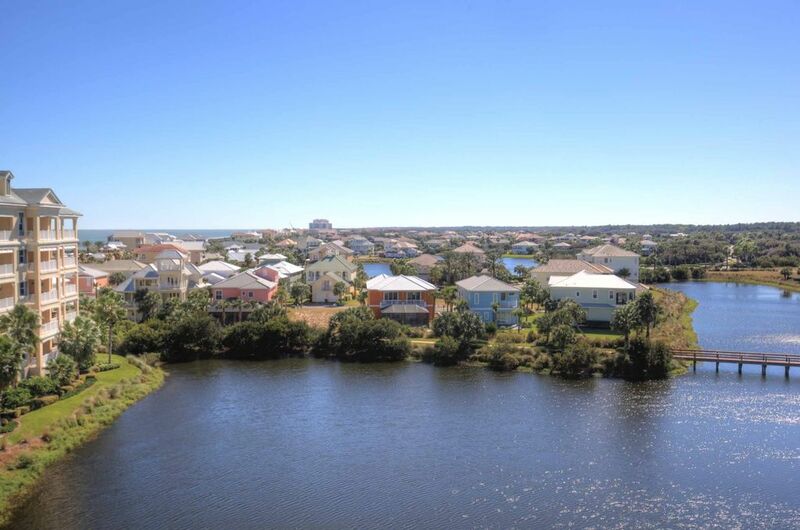 Enjoy the best of both worlds with signature lake views and partial ocean views from this magnificent top-floor condo in beautiful Cinnamon Beach at Ocean Hammock! Vacation in luxury in this spectacular corner penthouse! Spacious layout features over 2000 sq. ft. under air, plus an oversized balcony offering amazing views of the lake and ocean! 18' cathedral ceilings make this residence feel even bigger than it is! Luxurious master suite and two comfortable guest suites offer plenty of room for the whole family. This gorgeous corner condo has windows along the side for lots of natural sunlight, and three full bathrooms, including private access from each bedroom. Enjoy your morning coffee and the newspaper in the breakfast nook, or sit on the balcony and listen to the waves crash in. Exquisitely furnished throughout! The condo was beautiful, clean, and perfectly located in the development. We were able to see the sunrise and set from the balcony overlooking the lake and ocean views. We stayed 8 nights in this remarkable condo and loved every day of it. With the high ceilings, the spacious rooms and the large terrace there is so much space to enjoy, together with tasteful, high quality furniture in a clean and lovingly decorated environment. All domestic appliances, internet and television worked well so there was absolutely nothing to complain about. The beautiful pool area was only a short 6 min walk away and we spent every day a few hours there. It was pretty hard for us to say goodbye after our stay and even before we had to leave we started thinking about coming back here in the future. We think that says it all! The area of Palm Coast is beautiful. 1161 unit met all of our expectations and beyond. All the comforts of home and beautifully maintained. Short walk to beach and pool area. Great time had by all. This was our 2nd time staying. We was so happy to stay a week at the beautiful place like last year. But it was short lived due to the beach was very dangerous. Unlike last year were the beaches was perfect this year the beach was lined with sharp rock. Me and my kids have cuts and scrapes all over our feet from tring to enter the water. My wife almost broke her ankle. Then you go to the pool and the manger tells you this is the no fun pool that i need to talk softly. 2000 dollars and i can not enjoy the beach or pool. But the condo was beautiful. Our family loved the roominess of the condo. It was a pleasurable experience to stay in#1161 for a week. We had one small problem with the refrigerator not making ice, but the property manager came quickly and fixed it. The condo was spotless when we arrived, and had beautiful bedding and linens. Plenty of towels and the kitchen cookware was clean and very satisfactory. Internet was great as we needed to keep up with email, etc... The only thing I would recommend is that they keep the pool and game rooms open later at night. And why not add Shuffleboard? I would highly recommend this rental unit and will definitely rent from them again!